When I was approached to teach a course on Advance Wilderness Skills to a group of college students in an Outdoor Adventure Program, I assumed fire-lighting and wilderness navigation would be the subjects I'd spend the most time on. I was wrong. The students were already somewhat skilled on the common abilities needed for extended wilderness trips. What the students didn’t have was the ability to make good, nutritious, lightweight meals. 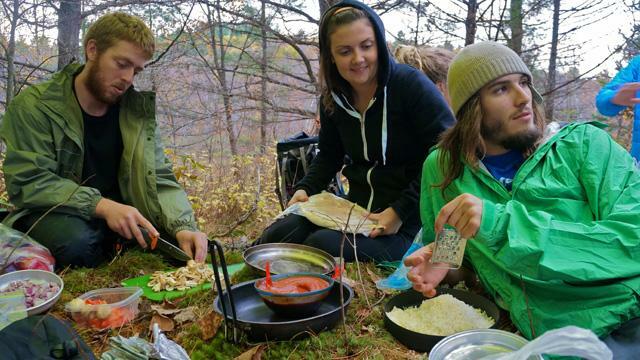 They were packing things like canned beans and ravioli; mac-and-cheese was the number-one meal consumed; the average breakfast was toast and oatmeal; and only a handful of them had ever heard of dehydrating their own food — most would simply purchase the pricy pre-made packages at outdoor stores. I decided I would spend the majority of class time on menu planning. I think it was well worth it. Out on our last trip together — a weeklong bush hike — I graded the students heavily on their meals. Each breakfast, lunch and dinner had to be wholesome, lightweight as possible and relatively cheap (they were given a budget of $8 per meal). The most important, however, is they had to be tasty. Check out the attached video on what they made. Before the trip, I had them shop at the bulk food store. Bulk food stores are a saving grace for any camper. You’ll find all the ingredients necessary to make up your own meals. The prices are always cheaper than the supermarket and the meals you can make are far better than the store-bought freeze-dried stuff, which, for some reason, has a tendency to give you gas. Here are some of the basics you can pick up at any bulk food store. Lentils: The common Egyptian lentil is more widely used than the decorated lentil, which is split and has its outer husk removed. However, use the decorated type since its cooking time is far shorter and saves precious stove fuel. Rice: There is an endless assortment of rice that can be used in many different recipes. Precooked white rice (Minute Rice) is the less nutritious variety but it saves a lot on boiling time and fuel consumption. Mixing rice with lentils is a good idea. Together they provide a richer balance of protein. Pasta: Regular pastas can be bought at any supermarket and bulk food store — but so can whole-grain and vegetable pasta, which is far better for you. Beans: Dried beans really add to a meal. There are countless varieties, but to reduce cooking time it is crucial they are pre-soaked well before mealtime. Place them in a sealed container and let them soak in water a full day before using them in a meal. If you plan on using beans for an evening meal, make sure to place them in a sealed Zip-lock bag stuffed in your cook set, or a small waterbottle, in the morning. By the time you cook up dinner, the boiling time has reduced to 20 minutes rather than two hours. TVP: Textured Vegetable Protein (TVP) is a product commercially dried and used regularly by vegetarians and a meat substitute. It comes in granular or cubed form and is easily re-hydrated. Soy Grits: For a quick, high protein dinner, try soy grits. These are similar to soy flour except the soybeans have been toasted and cracked into tiny flakes, not ground into powder. Bulgur: Bulgur is made up of wheat kernels that have been cooked and dried. It has a nut-like flavour, which makes it a good breakfast meal, but also makes an excellent substitute for any recipe calling for ground beef. Toasted Buckwheat: Buckwheat is not in the wheat family. It’s a seed produced by a grass-like herb and is high in potassium and phosphorus. Soft Wheat Kernels: Wheat produces a one-seeded fruit called a kernel, often called wheat berries, and this is extremely high in protein. It’s the simplest form of wheat and was the lead crop in Egypt and Palestine. Millet: Millet does not contain gluten and is ranked as the least allergenic of grains. It’s also extremely high in B-complex vitamins and the most balanced in essential amino acids. Quinoa (pronounced Keen-wa): This “mother grain” is found in Andean Mountain regions of South America. It contains more protein than any other grain and is even a complex protein by itself. It is also high in fiber, minerals, and vitamins — making it an ancient food staple for the Inca civilization, as well as the present-day hungry camper. It takes little time to cook (even shorter than couscous) and will turn from white to transparent when done.